Becoming a parent for the first time can be a somewhat stressful event. Not only are new parents responsible for the care of their new little bundle of joy, but they've also entered into a new world of experiences that don't always have easy answers. From parenting techniques to health questions, new moms seek out advice from trusted friends, family, and other parents. In past generations, women didn't have the benefits of digital content and social media to help them crowdsource their questions with large groups of savvy moms, but now help can be a simple Facebook post away. As part of the POPSUGAR Insights #Momstamina study of moms, we asked moms to tell us who they rely on for parenting advice and which social platforms they tend to use most on a day-to-day basis. Overall, moms between the ages of 25 and 49 rely most on their parents (51%) and their spouse or significant other (51%) to provide advice on how to be a better parent. Friends (30%) and other moms (30%) are also important providers of insight and advice. Millennial moms (between the ages of 25 and 34) are more likely to rely on their parents (57%) and their spouse or significant other (55%) than moms overall, most likely due to the fact that millennial moms are becoming parents for the first time. 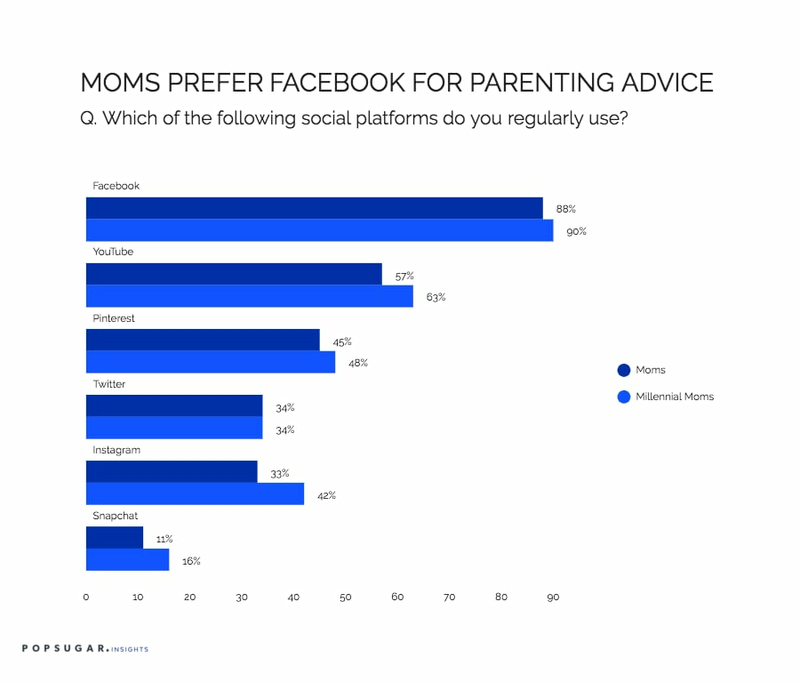 In terms of the social platforms that moms use to seek out advice and get help with parenting topics, Facebook is by far the leader with 88% (and 90% of millennial moms) saying they regularly use Facebook. For moms overall, YouTube (57%), Pinterest (45%), Twitter (34%), and Instagram (33%) round out the top five platforms. For millennial moms, YouTube (63%), Pinterest (48%), and Instagram (42%) rank two through four, and millennial moms are 45% more likely to use Snapchat (16%) than moms overall.